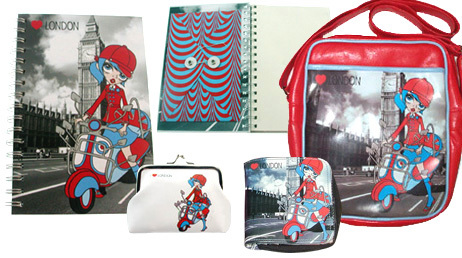 Here’s a collection of British Mod Girl accessories, including a purse, wallets and a notebook. It looks like they’re selling out although they may be easier to find on plasticlandclothing or other equally girly sites. This entry was posted in Bags, Miscellaneous, Stationery by Tracy. Bookmark the permalink.